Would you like to have a real wilderness experience? Bonanza Lake Campground is 876 feet above sea level in the Bonanza Range Mountains on Northern Vancouver Island between the Nimpkish and Tsitka Rivers. A large lake that covers 2226 acres, Bonanza Lake has a maximum depth of 528 feet. The lake is a large body of water and is 10 kilometers long with the Bonanza River exiting the north end of the lake flowing to Ida Lake and onto Beaver Cove. 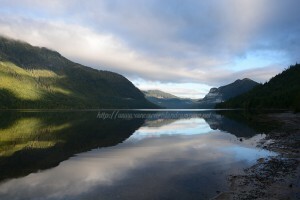 It is nestled amongst the Insular Mountains that run the length of Vancouver Island.